Believing in yourself starts early. That's why thousands of parents throughout Australia have turned to Rhee Taekwondo to give their child the best start to life. Bundaberg’s Premier Martial Art Prep classes for 3-5 year olds. Ideal for teaching young lefts and rights, and rights and wrongs. We offer a variety of locations with classes specifically designed for primary school aged children. The family that kicks together sticks together! Our family classes are great for kids, teens and adults. 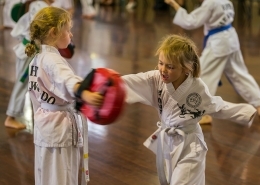 Rhee Taekwondo Bundaberg & Bargara has been Bundaberg’s first and foremost Art of Self Defence since the late 1970’s and over the decades has been the preferred choice for thousands of families to begin their martial art journey. All Rhee Taekwondo instructors are professionally taught and appointed by the Australian Wide organisation to provide the best martial art education to the local community they are a part of. Rhee Taekwondo Bundaberg & Bargara instructors all hold first aid certificates and work with children blue cards, they are also students themselves and continually seek to improve themselves in a variety of areas including leadership, bullying strategies and child behaviour to name a few. What does RTKD Bundaberg have to offer . . .
Rhee Taekwondo is Australia’s Largest non competition martial art organization with over 1000 classes nation wide. Locally we have a huge variety of class times and locations that offers our students unlimited monthly training as well as a unique grading system that allows students to promote when ever they are ready, all at no extra cost! 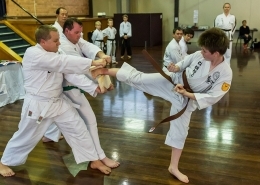 Rhee Taekwondo Bundaberg & Bargara is solely focused on self defence and creating the character of a martial art student and as such we don’t do any tournaments or competitions at any level. Instead we teach our students to be friendly, disciplined, happy people with a healthy self esteem that doesn’t require beating someone and earning a trophy to make them feel good. We want them to be the trophy and live every day as a champion in anything they choose to do. Rhee Taekwondo Bundaberg & Bargara are the only place you can find our juniors program for 3-5 years as well as a huge range of kids classes for primary school aged children and family classes for the whole family or adults who want a more traditional class. Students are also invited to monthly combined classes, quarterly Action Days and parents of enrolled students have the option of coming to a monthly parents fitness and self defence class, all for no charge, we simply want to give our students the best that they deserve. Why should I choose RTKD Bundaberg . . .
Rhee Taekwondo Bundaberg & Bargara is for people who want the best for their families. Our curriculum and classes are designed to push and mold students towards becoming someone great and not to settle for good, with over 170 students enrolled locally we invite you to come and see for yourself why we feel we are Bundaberg’s Biggest and Best Family Martial Art. Watch an impression of our yearly Camp Awesome! Many parents have concerns about their child learning a Martial Art like Rhee Taekwondo fearing that they’ll be hurt or be encouraged to hurt other children. Sadly there may be some cases of unprofessional instructors who encourage that behaviour or who simply aren’t qualified or experienced enough to educate their students properly we believe that most Australian Martial Arts are not only run professionally but are also working hard to change this common misconception. Martial Arts like Rhee Taekwondo with its Specialized Kids, Family and Junior that are designed around self-defence with a strict non-competition policy and instead focuses on teaching its students character development and living a balanced life. We have listed 5 of the biggest reasons we think all children should learn a professional Martial Art like Rhee Taekwondo. These traits, when taught the correct way, become a fun part of the class that students look forward to and often pick up surprisingly quickly. This in turn changes their attitude towards schooling and home studies which is why we believe they are the corner stone of any serious martial art. Some children aren’t suited to game sports like rugby or netball and prefer something where they get rewarded as individuals and/or can work at their own pace. With childhood obesity and similar health concerns for children becoming more common it can be life changing for some families to find something physical their child likes doing. Whether it’s for self-esteem, depression, anxiety or frustration students of all walks of life benefit from the physical exercise, the structured classes, uplifting atmosphere, self-achievements and clear goals and objectives. In a society where people doubt their self and their abilities, or are frustrated from lack of recognition, it can be a significant turning point in their life when they get that first promotion, break their first board or achieve the coveted rank of black belt. Martial Arts like Rhee Taekwondo understand that children already know how to fight. We hear about untrained people fighting all of the time in the news and in schools and playgrounds so we define Self-Defence as “getting home to see your family”. If that means running, hiding or avoiding the person then you’ve effectively defending yourself, without having to throw a single punch. Students are encouraged to make better choices, to think for themselves and not get lured by fake friends. To not “pay” the bully by giving the bully the reaction they want. To make friends through talking/playing/similarities so they don’t have anyone to bully them. To communicate clearly to antagonists to stop what they are doing and to tell teachers/parents what problems are occurring so they can be dealt with in the appropriate manner. Above all: to only use their techniques when it’s a last resort. A big THANK YOU to Nathan and Nicole and the rest of the Rhee Taekwondo team . My daughter has received an excellent report card today describing her as a well mannered and hard working child who has become a great role model . I truly believe it is the influence of her instructors that she has turned from a shy little girl to a confident girl who takes on any challenge . I couldn’t be more pleased with Rhee Taekwondo I recommend it to any parent who wants the best for their child. Thank you! Rhee Taekwondo has given my sons confidence, fitness, strive, fun with structure in a sport they love. My 5 year old boy has narcolepsy and to find him a sport or hobby he likes has been a real struggle. Rhee Taekwondo has given him a new identity and he loves it, he has a new focus which helps him medically as well as personally. I am very happy with both my boy’s progress and recommend Rhee Taekwondo to anyone and everyone. Rhee Taekwondo has helped Filip immensely in giving him his ‘own sport’. He enjoys the responsibility of turning up to class to ‘train and learn’ at his own pace. As a parent I have seen Filip mature and see less and less of his erratic behaviour as he’s now realising that there is a consequence to his actions, good and bad, and thank goodness he’s noticing that the good way is the better way. Looking back now I should have enrolled him earlier – I just had the perception he would fight more which didn’t happen at all. Thanks for starting to make my boy into a responsible one! Rhee Taekwondo changed my life. Before I joined Rhee Taekwondo was shy, withdrawn, very unfit and going no where. Shortly after starting friends and family began to see changes in me and I began to notice them too. My confidence improved as well as my fitness and state of mind. Rhee Tae Kwon-Do helped me set goals for myself and with the support from skilled trainers I have achieved each one of my goals. I also feel confident that I could defend myself should the need arise which is a good feeling. For me Rhee Tae Kwon-Do is not just training my body but also my mind. I could not imagine my life with out hearing the spirited shouts echoing through a hall or feeling the rush of air after dodging a kick or punch. This is why I love Rhee Taekwondo. Rhee Taekwondo is fun! You get to learn how to defend yourself. If something happens to you, you know what to do. I like self defence against grabs! My son started Rhee Taekwondo earlier this year. After watching his trial class I was inspired to join myself. Now we are both students in an incredible martial art. Rhee Taekwondo has given him greater self-confidence, taught him self-discipline and given him better focus, both at home and in the classroom. He now knows how to defend himself and diffuse a bullying situation should it arise. He has also been taught the importance of education, listening and carrying out instructions. He enjoys the games in class especially when he tags mum in Rhee Taekwondo stuck in the mud. Like all of us he looks forward to his next promotion. Thank you Rhee Taekwondo for the life skills my son needs to have. For myself, I have discovered the power of the mind and believe anything is possible. Not only have I learnt self-defence skills, but have gained better focus, a stronger mind and a wonderful sense of belief. Rhee Taekwondo has given me the opportunity to meet new people, gain knowledge, show leadership, improve my abilities, learn a new language, train with my son and believe in myself again. My achievements are now far more that completing the housework. Thank you Kwan Jang Nim Nathan for your support and thank you Master Rhee for your brilliance. Please enter your details to go into the draw!